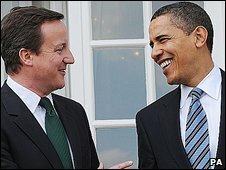 Conservative leader David Cameron has said US President Barack Obama is "incredibly impressive" after meeting him for the second time in London. Describing their meeting at the US ambassador's residence as "productive", Mr Cameron said Mr Obama was "extremely personable" and "easy to get on with". The two first met when the then Senator Obama visited the UK last summer. Earlier, in Parliament, Mr Cameron said "everyone" wanted G20 leaders to agree reforms on trade and tax reforms. But he attacked Gordon Brown for leaving the British economy "exposed". President Obama's meeting with Mr Cameron, which lasted about 30 minutes, came between his high-level one-to-ones with the Russian and Chinese presidents. Mr Cameron said the private meeting - which covered economic and foreign policy matters - was "excellent". Asked if Mr Obama was a man he could "do business with" - echoing Margaret Thatcher's famous comment about Mikhail Gorbachev in 1984 - Mr Cameron replied: "He is a very easy person to talk with and exchange views with. "He is an incredibly impressive politician and leader but he is also an extremely personable human being and someone it is easy to get on with and strike up a relationship with." There was much "common ground" between the Obama administration and the Conservatives, he added, stressing there was a "wide range of agreement" on many issues. David Cameron's wife, Samantha, also had a meeting with First Lady Michelle Obama. The president earlier held talks in Downing Street with Gordon Brown - afterwards President Obama praised Gordon Brown's "integrity" and efforts to secure a consensus for global reforms in London. Some commentators have suggested the meeting was a coup for Mr Cameron given the president's busy schedule and the fact it was not confirmed until late on that it would be scheduled. But under diplomatic protocol, foreign leaders often meet the leader of the main opposition party during major overseas trips. In the past few days, Mr Cameron has met Australian Prime Minister Kevin Rudd and Mexican President Felipe Calderon, who is on a state visit to the UK. Later on Wednesday, President Obama will visit Buckingham Palace for a private meeting with the Queen.